From coffee mornings and lunches to running events and bike rides, there is a whole range of activities you can enjoy while also supporting Cherry Lodge. On this page of the website you can see our events programme presented in two different ways. Use the drop-down menu immediately below this text to select either ‘Agenda’ (an interactive list with dates, which is the default option) or ‘Month’ (an interactive calendar that shows the planned events month by month). Each of these options provides an overview of our schduled events. You can find out more detailed information about an event in the following ways. If you are using the Agenda view, click on an event to see a display box and a Read More button to take you to the event page, where you will find full details including a map. If you are using the Monthly Calendar, hover your cursor over an event date to see a display box and then click to go to the event page. 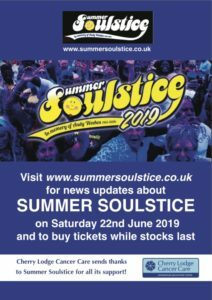 Barnet’s fabulous Summer Soulstice festival – held each year in memory of Andy Weekes and raising money for Cherry Lodge Cancer Care – will return on Saturday 22nd June 2019. Join the Soulstice crew at OEs’ Memorial Playing Fields, Mays Lane for 12 hours of soulful fun and frolics from 11am until 11pm. Enjoy great main-stage acts from Aswad, Alison Limerick, Andy Abraham, Louise Golbey, Natasha Watts, and Sa-ha-ra, plus music from 30+ DJs in three arenas of music. There will also be licensed bars, cocktails, food outlets, merchandise stalls, free kids play zone, entertainers, gazebo/picnic area, limited camping and car parking. All offering a fantastic day out for all the family. Book now to avoid disappointment. This event is expected to sell out well in advance – and there will be no tickets available on the day. Click here to buy tickets. Currently available are Event Only etickets costing £35 for adults, £20 for teens (13-17 years) and £2 for kids (1-12 years). Limited Camping Add-On etickets are also available at £20 for Saturday night or £35 for Friday and Saturday nights. Note that conditions apply. All prices include VAT but exclude booking fees. Please visit the Summer Soulstice website for full information about this year’s event, to read the back story, and to enjoy photos, film and music from previous years. 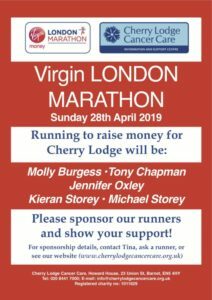 Since putting on their first festival in 2007, the Soulstice crew have given more than £300,000 to help fund Cherry Lodge’s much needed information and support services for people affected by cancer.